Order now from the Deaf Camps, Inc. Online Bookstore (autographed copies that support a great cause!) or amazon.com. Research shows that signing with young children of any ability or hearing level can increase IQ, stimulate language learning, enhance bonding, and raise a child’s self-esteem. More importantly to parents and educators, it improves everyday life and communication: a child who can express him or herself with the aid of signs is far less likely to get frustrated and throw tantrums and can initiate conversations about topics that interest him or her, which leads to adults talking more about those topics, which leads to a motivated and interested child absorbing more spoken language, which helps develop spoken language skills. Countless parents, teachers, and caregivers have seen the impact of using even one sign on a regular basis to make their lives with their children more harmonious. Signing with young children offers a communication tool that can assist children and families in communicating and developing a greater understanding of the world. Signing with children naturally complements other language and literacy activities such as books, fingerplays, rhymes, and songs. Little Hands and Big Hands: Children and Adults Signing Together offers solid background information on signing with children ages birth to five, along with hands-on games, fingerplays, songs, games, and crafts that caregivers and educators can use to smooth transitions, calm a fussy child, or engage a stubborn one. Photos and descriptions of the relevant signs accompany each activity. All signing vocabulary in this book is American Sign Language (ASL) – which, as a real language with real grammar, stimulates language centers of the brain unlike the made-up gestures found in some “baby signing” books. Betsy Diamant-Cohen, creator of Mother Goose on the Loose, recipient of the 2013 ASCLA Leadership and Professional Achievement Award, and author of many terrific resource books for librarians and early childhood educators, says: “This is an extraordinary book that has just been published by Huron Street Press, administered through ALA Editions. Author and ASL educator, Kathy MacMillan, has brilliantly combined the world of ASL with early literacy activities and presented them in a format that is easy for librarians to use. 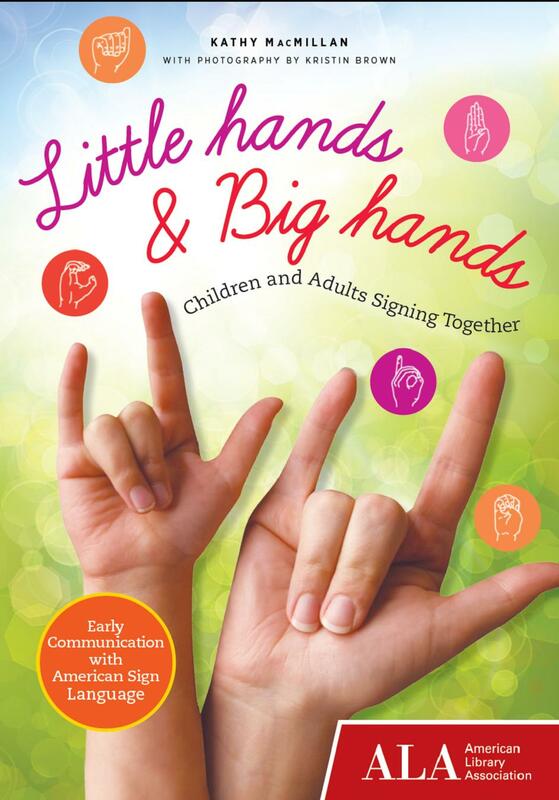 Written in understandable language, this book explains why ASL should be used over made-up signs, gives verbal and pictorial demonstrations of rhymes and letters, and describes why signing is beneficial for all children and not just those who are deaf or hard-of-hearing. Simple songs (many coined by MacMillan) accompanied by photographs of her son signing, describe children’s everyday activities with a sense of humor, such as “The Stinky Diaper Song.” Creative activities that foster parent/child bonding through ASL include “ASL Kisses” and inventive “Elephant Kisses.” An appendix at the end contains craft templates although many activities are replicable at home and can be created with everyday materials. The words to be signed in each rhyme or activity are written in ALL CAPS. A photo of either MacMillan or her son visually explains how to create the sign. The black and white photos are not cluttered, they’re pleasant to look at, and direction markings have been added when needed. Though some ASL resources are difficult to interpret, this one includes self-explanatory photographs that are easy to mimic. MacMillan’s descriptions of everyday life with baby are sometimes supplemented with vignettes about her own son. It is clear that MacMillan knows what she is talking about! ASL solutions are available for the child who takes a long time getting dressed, who doesn’t want to go to sleep, and who is not thrilled about taking a bath. Explanations and research support is seamlessly woven into each activity; their wording can be directly used as developmental tips in any library program with parents.